TCO 3—Given a simple problem, design and desk-check a solution algorithm requiring a modular design that is expressed in terms of pseudocode or program notes, input-process-output (IPO) analysis, and flow chart. TCO 4—Given a simple problem that requires one or more decisions, create a working solution that uses decisions with logical and relational expressions. TCO 8—Given a more complex problem, develop a complete solution that includes a comprehensive statement of the problem, complete program design, and program documentation. You will need to design an application that it will prompt a user for his or her hourly pay rate; his or her hours worked; and whether he or she is single, married, divorced, or widowed. 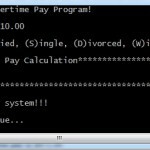 It will then calculate the user’s gross and net pay. 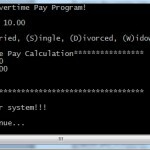 If the user works more than 40 hours, overtime is calculated at 1 ½ times the regular rate and displayed separately. If he or she is married, use a flat tax rate of 15%. If he or she is single, use 22%; if he or she is divorced, use 23%; and if he or she is widowed, use 13% (I realize that these are not very realistic). 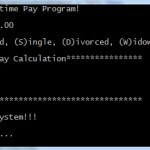 Below is a sample of what the program should do when run. Complete the steps and submit the completed file to the Dropbox. Please submit this file along with the complete project folder (in a zip file). List all variables you will use (use valid variable names). Indicate whether the data type is string, integer, or double, and so on. List the inputs, any processes/calculations, and outputs. Use the same valid variable names you used in Step 1. 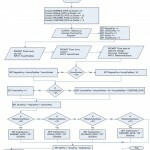 Use MS Visio to create a flowchart. Paste the flowchart here, or attach it as a separate document. Use the same valid variable names you used in Step 1. Describe your solution using pseudocode. Use the same valid variable names you selected in Step 1. Copy/paste your Visual Basic code here. 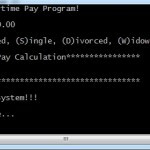 Paste a screenshot of the complete working program here. Submit a separate zipped file to the Dropbox containing the complete project folder. Thank you. Both the labs and exercises are great and worth the cost. Can u please provide some stuff related to this week quiz?